They're rushing your position! Hundreds of tiny plastic soldiers will overtake your toy box in a matter of seconds. 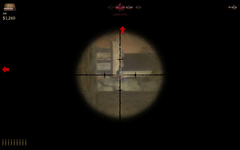 Do you pick them off with the careful aim of your sniper tower? Do you blast them from afar with the extended reach of your howitzer? Or do you wait for them come in close only to fall to flame and mustard gas? These are but a few of the decisions you will make while building your defensive line in Toy Soldiers for the PC. 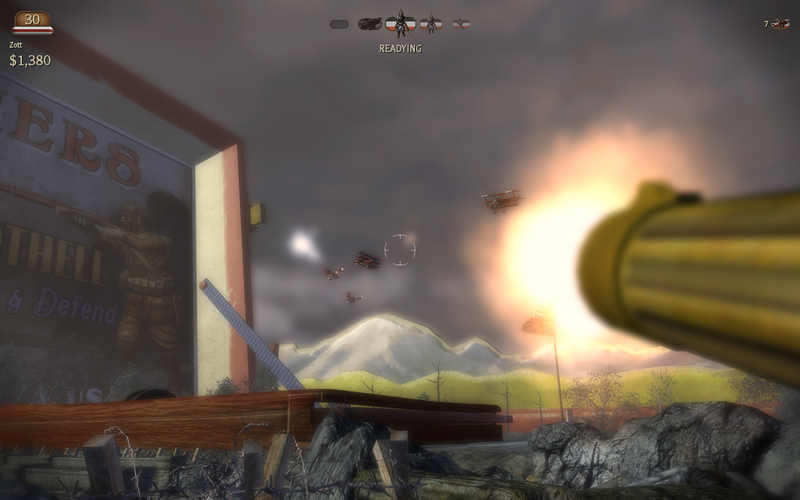 This game started as an Xbox Live Arcade title in 2010, but was ported to the PC in 2012. 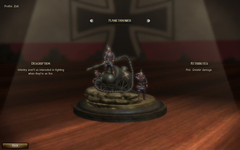 While the PC incarnation includes both the Xbox's DLC add-ons, 'Invasion' and 'The Kaiser's Battle', it lacks the multiplayer accompaniment. Judging from online comments I've read about the online experience, it isn't a huge loss. 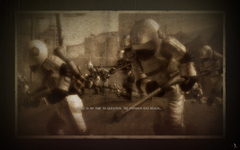 Multiplayer was seen as a repetitive rush to build one type of defense, and then use the vehicles to eat away at the opponent. So, ignoring the absence of multiplayer, what is in this toy box? In the traditional Tower Defense genre, the game gives the user a handful of tower types, to place anywhere they pleased, to prevent a monster horde from reaching a goal. Sometimes there would be upgrades to the towers to expand their various abilities, from slowing mobs, to increasing AoE. Strategic placing of the towers was of upmost concern in blocking paths, and maximizing damage dealt. 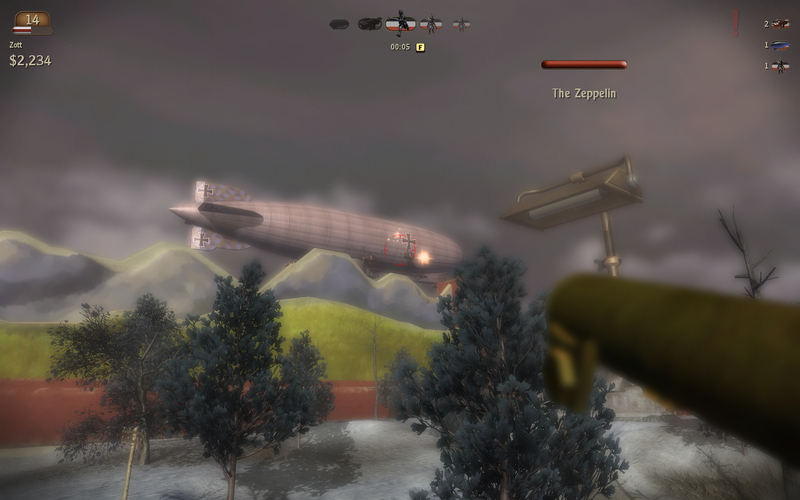 Recently, tower defense games have been giving the player a more direct role in the confrontation. 'Orcs Must Die', for example, kept the traditional elements, but changed the perspective to a third person character that could take part in the battle. Toy Soldiers adopts similar elements, while lacking in the fundamentals. 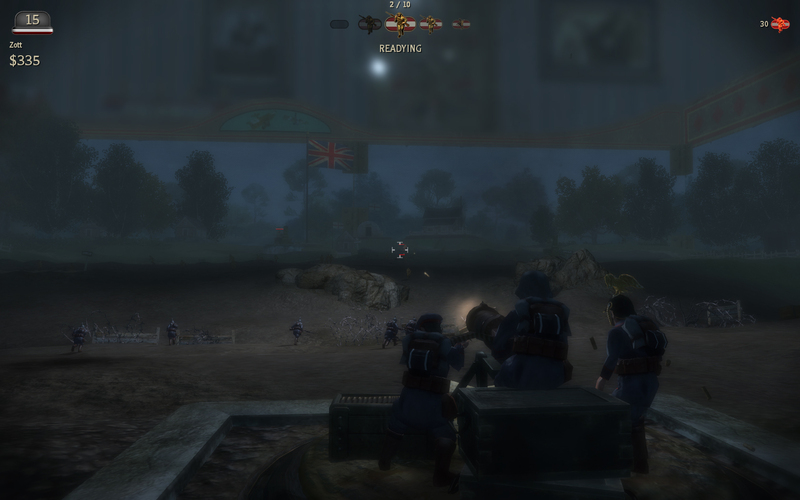 Following a World War I theme, players must prevent the likes of equestrians, bi-planes, tanks and, of course, toy soldiers from making their way into your base. To combat them, the player chooses from an arsenal of five different types of defensive structures. Over the course of the campaign, additional upgrades are unlocked for the emplacements that expand their capabilities. These upgrades were a tantalizing carrot to the next level. 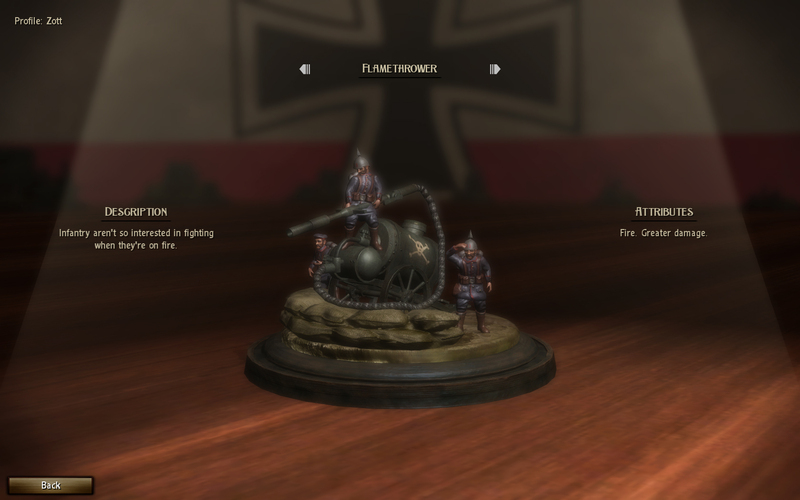 Where Toy Soldiers differs from the traditional tower defense model is two-fold: limited building space and allowing the player to control turrets directly. The biggest problem with Toy Soldiers stemmed from the limited building spots per level. 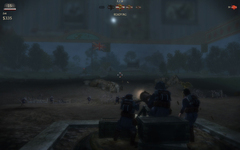 At the beginning of the match, proper placement and control of the defenses were critical to surviving the initial onslaught. 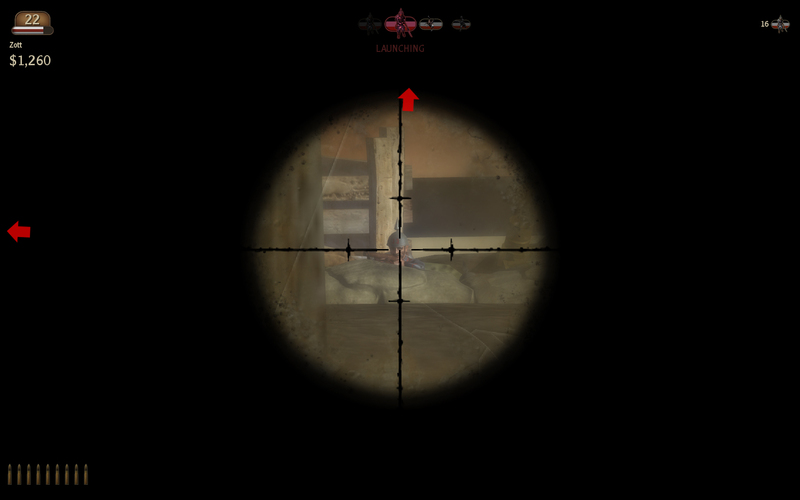 Many levels were restarted by choosing the wrong starting emplacement. Using vehicles, if available, was also mandatory to hold the ground. However, as the available spaces became filled, the defense became self-sustaining. By the middle of most matches I had built in all spots, upgraded them as far as I needed, and the game practically played itself. This was on Hard mind you. The game offers an elite difficulty, where only player-controlled towers actually fire, but at this point, the game is barely fits into the tower defense genre anymore. Furthermore, limiting placement consequently limits placement strategy. Barbed wire can be placed anywhere to slow down soldier movement, but when tanks come rolling through, there was less that could be done to affect the outcome. I would like the ability to wall the enemy in with machine gun nests thank you very much. Odd winning strategies were a draw in tower defense games. What is so weird about pre-defined patterns? At the click of a button, players can control any of the defenses to boost its effectiveness. The machine gun nest, when controlled, fires twice as fast. Not to mention that as the player you can make better strategic decisions about which units to attack. 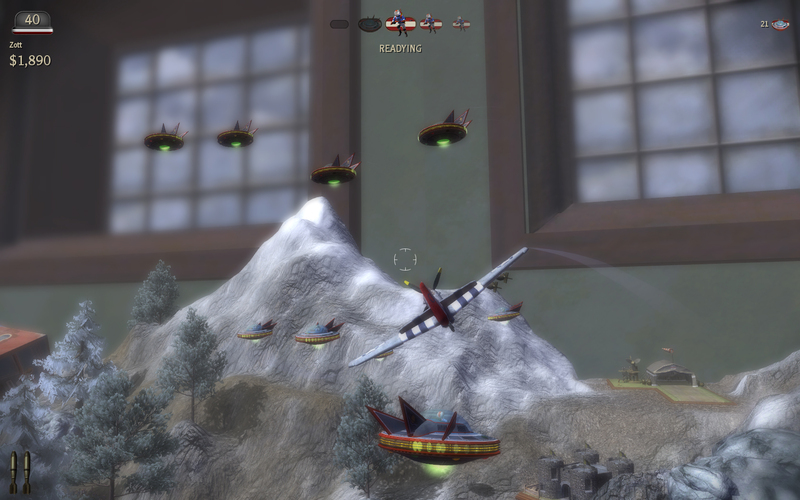 Where AI controlled emplacements will only fire on units within range, the player has no such limitation to his logic. The game never directly states what the advantages given by player control are but for the machine gun, it was obvious. Similar was the mortar, which is allowed a 3-fire burst compared to a normal one. For the long-range howitzer, however, besides the ability to guide the shot in a 'Bullet Time' way, I didn't feel any more competent than letting the AI do the work for me. I would also have liked a tooltip to detail this player bonus as well as general the statistics for the structures. For some, upgrading was not superior. I think the developers were aware of their folly with the limited spots to build structures. To remedy this, they created something sinister, something devious, something that would take all those carefully picked structures and put them to the test. I'm speaking of a BOSS. Bosses are bullet sponges and can crunch your base buildings. While you've probably maxxed out every space, bosses require careful management of all the structures to win. Losing to a boss at the last moment is rage inducing, but my resistance to surrender meant their ruse was working. The snarky notice telling me to try out casual after losing on Hard probably helped. Bosses may have been annoying, but considering placement design, they were necessary to add challenge. Usual tactics for beating bosses include: Building nothing different, and shooting it all to hell. For the price (I paid $2.50), the game packs greater than ten hours of content. After completing the game once, a Campaign+ offers the same missions using German units, and some remixed levels. Survival maps test how long one can manage defending with the limited building spots and units available. Finally, both DLC packages can be thought of as extensions of the campaign design, with three additional maps in each package, playing mostly the same. The appropriately titled 'Invasion' DLC hints to the fire trucks and space men who have stumbled into the wrong toy box to engage in war, and replace the standard WWI themed units. I was more partial to that DLC than 'The Kaiser's Battle' for changing more than just map design and having a difficulty more challenging and engaging than the standard campaign. As far as sounds and music: Being greeted on the main menu with era-appropriate music, complete with, vinyl scratches sets the mood for the rest of the game. In game has no music of note, but the sounds of war are gratuitous enough, with the bombastic Mother canon, and sirens of approaching forces. The high-pitched voices attached to the foot soldiers are a cute addition. And how they clumsily trip, giving opportunity for that last sniper shot is just dawwwwww. While I had no problems with the game's sounds, the game apparently did, as it suffered from audio cutout and stutter, even with the most recent patch of 1.1. The battlefield's graphics are characteristically plastic and diminutive. The tilt-shift blur added to the camera plays a big part in that. Scenic backdrops, such as of a living room, complete with mounted deer's head, complete the effect. The charming display is only muddled by my poor performance. Customary of a port, few graphical options are available to tweak, so I resorted to downsizing the resolution on my 9700m GT to 1024x768 from 1680x1050. A commoner's GPU by today's standards, but considering Toy Soldier's Xbox 360 roots, I was expecting to push the game a little higher. Overall, for the cheap price, Toy Soldiers' tiny battlefields are a suitable venture for those who enjoy interacting with a tower defense environment, and much less the careful planning of the tower defenses. The game is more of a strategy game. The graphic is not as awesome basing my opinion on current standard.